I write a lot about this concept - how having less leads to wanting less which leads to a simpler life. And that is the aim, to lead a simpler life. My yearning for a simple life, or even just a simpler life, means that I have started to re-evaluate every single decision, product, activity, even feeling that I bring into our home. But as we are finalising our packing so that we can move at the end of the week I have realised that in some aspects I have failed. I sit in my office, surrounded by at least 30 boxes, with about 200 more in the living room. All full of things. And not always useful things. Some of my things I keep because they are pretty, or I am a bit sentimental (doesn’t happen often so I keep whatever I feel sentimental about) or I just LOVE them. So I have a lot of things. But I guess that is not really a problem. Although I have lots and lots of possessions, I use all of them. If something doesn’t have an apparent use (and making me feel good is a use) then it will move out of the house. I don’t have doubles. I stick to the “one in, one out” rule and I only replace when the item cannot be salvaged. So in a sense, I am still a minimalist. I love that! To me, it means two things. 1. What you are judging me for is simply a reflection of where you feel you are lacking in your own life, and 2. Whatever you think of me will not make a difference in my life. I am strong and secure in my beliefs, choices and lifestyle. The power that such a realisation brings in unbelievable! To realise that you are more than people’s ideas about you, and that you do not need them in order to be driven or to accomplish a happy life. That leads me to the point of today’s post. Anybody can become a minimalist. It is not about the amount of things you own - you can be a minimalist if you have more than 4 forks and 2 sheets. You can live a minimal life even if your entire life, and all your possessions, doesn’t fit into a backpack. Kuddos to you if it does! I will need a MUCH bigger backpack. My life is full. Not really full of stuff, but full of life, laughter, hard work and lots of memories. And my stuff is the road that leads me to these things. So if you feel less than, please stop! Knowing who you are and what you want out of life will help you set goals, boundaries and other key indicators of what a successful life will look like, for you. By knowing yourself you will quickly be able to answer the question “do I need it, do I want it, or do I simply have it.” Never approach any challenge or anything to do with minimalism, decluttering or simplifying without checking in with yourself first. So often we hold on to thinks because that is they way it has always been. To embark on your minimalist journey you need to break habits and set routines. The difference? Habits are those things we do without thinking. It is a very low-cognitive activity, and most of the time we have habits around things that are unimportant, or even down right destructive. Smoking is a habit, and hoarding is also a habit. Routines are flows that we design and decide on ourselves. They require higher cognitive commitment in order to work properly, and once instilled and practised they became a lifestyle. Routines can be very beneficial, such as a morning routine that enables you to get up, exercise, start work and sort out the house in a fraction of time because you know exactly what to expect, and when to expect it. Those who fail to plan plan to fail right? Right. If you do not plan your next day you will forget to get all your work essentials ready, and that means you might leave the house without things that are essential. Before I was an excellent planner I often used to leave the house without my notebook and pen, or a jacket, or my coffee cup. That meant having to buy things on the way because I needed them, and there was no time to go back to the house. This increases our belongings, decreases our income, and makes us miserable because we feel like such failures. Plan your life! One of the core principles of minimalism is not buying things that you will use once or twice, if you can borrow them. So instead of buying a new dress for a work formal, you might borrow one from a friend, and vice versa. The key here is to remember to whom you borrowed what, and to get it back afterwards. If you don’t, you will end up having to replace things when you need it. Not ideal and a big waste of resources. Make a list that you can refer back to, documenting the item, the date, and the borrower. But the flip-side is also true - remember from whom you borrowed things and give it back the moment you don’t need it anymore, or as you agreed to. Have one of each. You cannot possibly use two hairdryers, at the same time. Or two kettles. Or two pairs of the same shoes. Yes there is wisdom in having an extra item for in case the first one broke, but seriously - the shops will always have hairdryers and kettles. So stop hoarding things because you are scared. Replace them as they break. Until then, donate or sell your duplicates. Same goes for food. Although I encourage having a stocked pantry, I strongly discourage you to store so much food that you will be ready for the apocalypse. Things on the shelf is merely money on the shelf, and if you have no use for it in the coming month, then fight the urge to buy it. A great reason to declutter! Oh the beauty of this rule. Basically it means you replace when it cannot be salvaged. Or if you want something new, you need to get rid of something old first. It doesn’t have to be the same item, e.g. a new dress so you need to get rid of an old dress. It merely means you keep the balance by getting rid of something else, e.g. a new dress so you donate a pair of shoes that you never wear. In essence, if you have a total of 100 possessions, you will keep on having only 100 possessions. Try this, often it is one of the easiest and most pain-free ways to start your minimalism journey. Marie Kondo says you should only keep things that spark joy in your life. I half agree - keep things that give you joy, but also find joy in things that you keep. It sounds a bit confusing but basically I mean that you need to find joy even in the daily essentials. I cannot see what joy I can get from a toaster, and yet I have one. Because it fulfils a purpose, it has a use and I use it. You can decide what this will look like, depending on where you are on your journey, your needs and your lifestyle. Some people do a no spend year, others a no spend month, You can even start with a no spend weekend. Decide beforehand what you will count as spending - buying essentials such as food should not count. And then work out what the going forward will be - will you keep a no-spend limit on clothes? Or shoes? Or even gadgets for the kitchen? A word of caution - do not allow yourself to buy something as a reward for getting through the no-spend challenge! Your budget and your space will thank you. As simple as that. If you don’t use it, then let it go. Of course there are exceptions. Maybe it is a seasonal item, or something that you only use for special occasions. Of course that doesn’t mean you can keep all 10 formal dresses… Take a leaf from Elsa’s book and let it go. 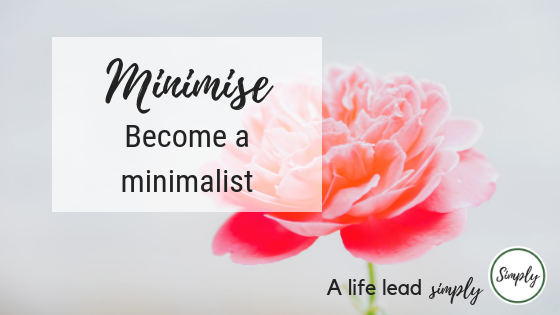 Whether this is by changing your wardrobe to a capsule wardrobe, starting to meal plan, or automating as many of your business processes as possible, being a minimalist means that you make your life simpler. Find ways to do just that, and THAT will be the spark of joy you so rightly search for. We respect your privacy. We will never share your details, all info collected is used only for our own analytics. Thank you! Looking forward to getting to know you, we just love our tribe!